Tom Justice is passionate about cycling, and was on the shortlist for the US Olympic Team. Also, he’s a bank robber. Choir Boy was adapted from producer Katie Mingle’s interview with Tom, which originally appeared on the Breaking the Bank episode of 99% Invisible. Okay. Well, by the way, I haven’t looked at this in like six to eight years, so this is odd. I wrote that because I knew myself that as the years would go by, I would lose the pathology of the way I was thinking. You can do it. This is it. You’re on the right path. Go get yours. This may not be right, but all I wanted to do was rob one bank, just to feel what this was like. That’s what I wanted. This may sound strange, but I looked at it in really practical terms. I said, “Well, I would like to do it this year. Let me look at my schedule. If you want this experience, it’s gotta happen between these two months, because after that you need buckle down for grad school. From Radiotopia, you’re listening to Love and Radio. I’m Nick van der Kolk. Today’s episode: Choir Boy, featuring Tom Justice. I grew up in Libertyville, Illinois, which is about 35-40 miles North of the city Chicago. It’s where people grow up straight, and right, and are polite, and so was I… to a point. But high-school was pretty good. Popular kid, got elected as class president, senior year. My general public persona is square, nice guy. Oh, that’s the type of guy I want my sister to date… But I wanted something else, I wanted to be something else. A friend of mine and her family, they used to go to watch the bike races at Northbrook velodrome, and they simply asked if I would like to go with them. They sat in the bleachers, got popcorn, and I was really impressed. I had never seen anything like that before. I bought a track bike at RRB Cyclery in Kenilworth, and then in the freshman year I was racing bikes on a track bike. You kind of know, as a teenager, like “Hey, you’re good, because you’re faster than adults.” It offered an identity. I’d started DePaul’s Masters of Education program to be a public school teacher, but I wasn’t completely committed to it. I had a list of things that I wanted to do. [Be an EMT.] I was a caseworker at a social service agency, [Be a ferrier.] went to the French Foreign Legion, [Learn horseshoeing.] applied to the priesthood, [Learn how to fly a plane.] so I was kind of in a pattern of seeking. Not satisfied. I had a list of things that I wanted to do, and a bank robbery was just on it. It’s like the great American crime. It’s a part of our movies, it’s a part of our books, and it’s a part of our folklore. It’s an honest thing to do. You will not believe how many people say, “Oh my god, I’ve always wanted to rob a bank. What’s that like?” I just had the desire. To just quench that interest. I just plotted out how could I do it, how could I get away, how could I just enjoy that in a slow burn, by myself. You know what, a cop is not gonna stop somebody with shaved legs and a tight outfit, and a riding helmet. It’s sort of like the opposite of the profile. In order for it to be successful, like in many things that are physical, it’s helpful to sort of block through the motions, almost as an actor would. I had a sort of blind or a safe spot, that’s where I put my bike. I practiced physically walking the distance from my safe spot to the front door of the bank. Once I had that physical distance, I would actually count the steps, I would count the moves… Now, I don’t have the same space in my tiny apartment, so I would march in place. I created something that’s a similar level to a transaction plain at a bank. I would clear off a bookshelf in my apartment – that substituted for being in the bank. I wanted to practice having the note, taking the note out of my back pocket, presenting it in a cool, crisp, fluid motion; I would practice literally hundreds of times. How old were you when you robbed your first bank? I took the sort of back way from our place to the bank, so I wouldn’t be seen on the major roads. Once I got to the spot, leaned my bike up, make my setup, and as I’m walking to the bank I have this unusual bounce to my step. I’m scared, but becoming proud of myself. I’m doing something I set out to do. At this point is there still a voice in your head going, “Tom, don’t do this. This is crazy”? Strangely, there’s like a tractor beam pulling me towards the completion of this. It’s almost as if I’m not in control. I’ve laid out orders for myself, and I’m letting them happen. I’ve written several short stories about what it feels like. It’s like nothing else. Transcendent, beautiful, serene. It happens in steps. It’s a gradual plateauing from your safety spot, your skiff, then the butterflies begin. You walk your approach to the bank, it begins to really sort of, really kicks in. When your hand pulls upon the door of the bank, that’s another step up. As you’re approaching the teller window, even higher. Then there’s the walk back. A long, long walk back, because your instinct is to run. You can hear commotion going on, and you don’t really know – is there somebody running after you? You can’t really look back, and it’s also… At the time it was a really exciting walk, because you have no idea what’s gonna happen. I got to my blind, my changing spot. All of the physical repetition of me doing this hundreds of times, it all came into play. Take off all of the clothes that I was wearing in the bank. Underneath, cycling clothes. Put on your helmet. Put on your glasses. Put on your messenger bag. Grab your bike, swing your right leg over the front handlebars. Foot in, click, start riding. The amount taken from the first bank was around five thousand dollars. I put the money not where I was living, but I put it in my bedroom of my parent’s house. It stayed there for like three, four months. I decided to revisit it, so I went back, opened the plastic bag, and I remember dumping the money down in a pile and saying to myself, “Oh my god, if my mom finds this, she’ll be so pissed.” That entire thing, I tossed it in the McDonald’s dumpster and another fast food dumpster. All of the bills that were like in sequential order, like the 20s and the 100s, I believed – from being a student of television crime shows – that they could be trackable. I would put those in packets, and I would put them in key spots where homeless men would hang out at in Uptown. In these bags, these brown lunch sacks. But the important part was that I had to make the brown bags not look crumpled and junky, because if they looked crumpled and junky, why would you even open that. They had to look pristine and crisp. So some of it you just threw away, and some of it you tried to give away. Right. Oh, I definitely kept all the two-dollar bills. For some reason, I was not afraid of those. They were in sequential order, and I would take out one or two, and those were cool souvenirs. And how long before you did the next one? So we’re gonna look at this thing that you wrote called “Mostly Twos”. [Laughs.] That’s really how I felt. That is, honestly, what I believed. That I was somehow boosting myself. Like, “I’m sorry that I’m inconveniencing you, but I’m in a thing right now.” Because what bank robbery did for me was it made me feel something, that I was special again. And that was like medicine. Or better than medicine; it was medicine and growth. Yeah… It made me a better person, that’s what I thought at the time. But it made me into a better person because without it I was just – I was nobody. I was common. The first one, and then the second one… I thought, “Oh, well this is just sort of like a bad bottle you reach for.” What changed was when the robberies became more clustered and I needed them more. It was when I was training for Olympic trials in San Diego, in 2000, for bike racing as a category I, which I was. There’s only a handful of them in the United States, so I’m in automatic qualifier for Olympic trials. So I’m in San Diego training for the Olympic trials. I strain my back to such a level that I literally couldn’t get out of bed. I was also robbing banks there in San Diego. It was just sort of something to do. After injuring myself, I knew that the Olympic trials was going to be not a reality. That I was just sort of gonna roll back home in Chicago. That moment was extremely depressing. That’s when the sort of bank robberies kicked into high gear. I was looking in the Chicago Reader for a roommate. This is May of 2000. This guy is like, “Hey, I’ll check out the apartment”, and he’s like “I’m not here most of the times, because I work nights, so you and I probably won’t see each other.” You work nights, huh? I’m like, “Okay. What are you… Are you an exotic dancer?” He said, “No, I’m a Chicago Police officer.” I’m like, “I’ll take it.” I thought this was an interesting dynamic: to rob banks and live with a cop. I said, I can’t pass this up. 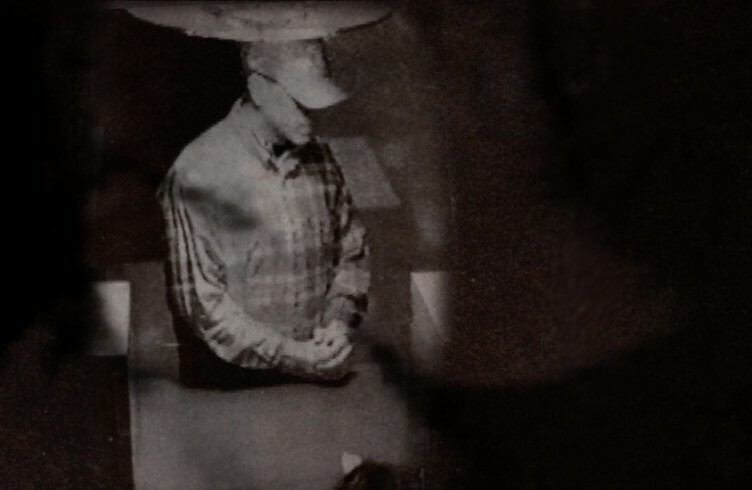 They called me ‘the choir boy robber’ simply because when I went in to rob a bank, I simply presented my note to the teller across the transaction plain, returned the note into my pocket, and then I simply placed my hands upon the transaction plain. I was like, “Put your hands, fold them nicely. Just put them right there. Put everybody at ease. I don’t wanna freak anybody out.” I felt like I had something… I mean, I knew I had something, but I had a secret. And that’s mine. Okay, so I could say… In the spring of 2001, I moved to the Bay Area, and it was a spectacular time to rob banks. Why was it a spectacular time to rob banks? I don’t know. I mean, something new was in the air… There was an electricity. Now, this is kind of late in the game… This is in my last six bank robberies. So I robbed 20 without using anything for dope, but the last six, I robbed with the express purpose of using that money for dope. In Walnut Creek, California, suburb of San Francisco, the bank robbery, everything went great. I’m in like the third floor of a parking garage, and I’m cruising down on my bike. I’m entering this alley, and right as I’m about to exit the alley, a cop car passes me. I could tell that he applies his breaks. I continued on my bicycle, and then I could tell that he’s behind me. There was a hospital ambulance parking zone, so I kind of pulled in there, and I start to adjust my rear brake and derailleur, just to buy some time and try to think about what I should be doing. And sure enough, he pulls right into the spot. He’s super friendly, a really nice guy. [- So, what’s going on? – You know, there was a call about a disturbance back there… So, if you don’t mind, just hang here for a second. During our back-and-forth, I put one foot into one of my pedals, I clicked into one of my clipless pedals. He’s like, “You know, if you can, you need to get off that bike and I’m gonna check out your bag”, and I said, “Sure, absolutely. I just need to click this other pedal in first, they’re kind of like counter-balanced, so I can get out.” He said, “Fine.” I click my left foot into the pedal, take a look to the left and right, and start riding away. Full speed. Everything I’ve got. It was after I realized that probably a shift change in law enforcement was happening, that it was safe, and I just sort of pushed myself out of that thorn bush hole, got back up and walked the two miles to my car. That was a long walk. I didn’t have anything with me, and I wanted to not look like such a freak and so nervous. So I pulled out my small wallet, and I pretended that my wallet was like a cell-phone, and I put it up against my ear, and I was talking with my wallet. It added an air of normalcy to someone walking down Main Street who’s half wet, with a bag, you know, like a bag of money. Why didn’t you get rid of the money like when you were robbed the first one? You were so careful, and now you have actually a real reason to be afraid of being caught with it, and you held on to it. I don’t know, because I was gonna use that money for dope. I knew it would mean nothing if I tossed it; that all of this was for nothing. And you knew they had found your bike, presumably, right? Were you worried about it? If I put you, as a private person, on the case – here are the pieces of evidence, here’s a bike, here’s a helmet – you yourself would be able to trace it within two days. When the federal government took three months, I thought “They’re not coming.” But the wheels of justice are slow, but sure. In May of 2002, as I was pulling away from my parent’s house after having dinner there, local police as well as several FBI agents pulled me over. I was arrested in Ace Hardware, in Libertyville, Illinois. We hung out at the Libertyville Police Department Station for a little bit, and then the two FBI agents drove me… It was pretty funny, they drove at like 100 mph down 94. I’d never been in a car going 100 mph, it was incredible. I mean, it was scary… Because I didn’t have a seatbelt, I was scared! Now, mind you, I had no concept that what I was doing would affect my family, mother, father, sister. Nothing. And I’ve been so selfish for so long… I knew it was gonna affect my family when they came to visit me, some one or two days after I’d gotten arrested. I saw the pain upon them, and it felt so bad. I wasn’t even thinking about them. I think, for me, nine years in prison… There was regret, but it was regret out of self pity. I think that’s a romantic fantasy that the world at large has, that prison is contemplative, and it’s like a convent or seminary. And it can be, but the reality is that you’re just who you are, but you’re just in there. Did I treat it like a contemplative time? Yeah, I did. I completed that masters degree in psychology, I wrote a doctoral dissertation proposal, which took a lot of time and resources. In terms of regret, I didn’t figure out regret, or that I was supposed to feel regret, until I got out. Do you remember how you and I first met? Yeah, and when I picked up the bike, you basically told me of your whole story, you told me you had just gotten out of prison for robbing banks. I was really surprised, I guess, how quickly you came out with that, and I felt like you were even like flirting with me, like, it was a way to talk to me. Do you, would you still do that now? No, I would not do that now. My thinking at the time was that I was still in the mindset of prison. Bank robbers have a great status in prison. I developed the sense that it was okay. It took a full year for me to figure out that I should not mention prison when I meet somebody. Because I came out thinking I had done my time, “I done the crime and done the time”, and now I should be able to float on some sort of cushion of civil credit. I understand now that it’s not something to be proud of. I thought that this thing, this crime, and prison time, this albatross, this ball and chain, I wanted to shine it up, detail it and use it as a badge of… Not a badge of honor, but as a… I did something. I mean, I didn’t do a… It’s hard to describe. It’s such a huge part of your life, and it’s going to define you. How can I not use it in the rest of my life? But the truth is, you can’t. You can’t, because it’s alienating, it just shuts doors. So it’s been an adjustment. Bank robbery was my medicine, but what do I do now? I don’t know what it is. I’m okay. Honestly, I’m doing okay, but I’m still waiting to find something to get my pickaxe into. Something in life, something that’s good, something that’s decent. I’m still looking for it. Okay, should I go ahead? Hi, my name’s Tom Justice. I robbed 26 banks in three different states. I served nine years in a federal prison, and now I’m out. Life’s good. You know, honestly, and I’m not even joking, I’m not trying to be – what’s the word, because I don’t even know… I’m not trying to be macho, or cool. Hold on a second… The train. …kids playing in the background. We’ve got crazy kids in the background, Katie. Katie, we’ve got some lively birds outside, we cannot continue. Over. Yeah, yeah. Okay. I think good. Yeah. Finally. God, that was long. Okay.